Article 625 covers Electric Vehicle Charging System and covers Wiring Methods, Equipment Construction, Control and Protection, and Electric Vehicle Supply Equipment Locations. What is it for? This is the spec that Engineering firms and Electricians in the US have to follow for proper design and installation of EV Infrastructure. Purchase the entire NEC 2008 Electrical Code here. Click here to see a copy of the obsolete 1999 Version of Article 625. What is it for? 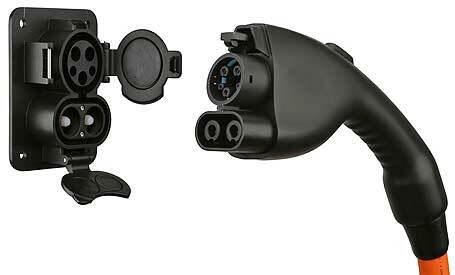 The J1772 is destined to be the standard plug/connector for electric vehicles in North America and Asia. It supports Level 1 and Level 2 charging in North America. The J1772 Combo Connector (a.k.a. FrankenPlug) which combines the current J1772 and high power (90kW) DC charging in one plug. This creates a US Standard for Level 3 and saves automakers from installing two connectors/filler doors on a car. You'll only see this plug on future Level 3 chargers. You can read about it here. What is it for? SAE J2293 establishes requirements for Electric Vehicles (EV) and the off- board Electric Vehicle Supply Equipment (EVSE) used to transfer electrical energy to an EV from an Electric Utility Power System (Utility) in North America. This document defines, either directly or by reference, all characteristics of the total EV Energy Transfer System (EV-ETS) necessary to insure the functional interoperability of an EV and EVSE of the same physical system architecture. The ETS, regardless of architecture, is responsible for the conversion of AC electrical energy into DC electrical energy that can be used to charge the Storage Battery of an EV, as shown. What is it for? J2836/1 establishes use cases for two-way communication between plug-in electric vehicles and the electric power grid, for energy transfer and other applications. What is it for? The 62196 is the EUs standard plug/connector for electric vehicles. What is it for? The UL defines basic safety standards for products sold in America and tests products against these standards. You'll notice that nearly devices that use electricity have a UL symbol on them denoting that it was certified and tested with UL. If you are building a EV charging solution, make sure the components you use are UL certified. This standard is used to cover inverters or converters used to modify voltages on board an EV. These products can be stand alone devices or used within other devices, such as part of a charger. This standard covers both on-board and off-board chargers, where a charger is a device that supplies charging current to a battery. The products may be used indoors or outdoors unless considered on-board, in which case they are considered outdoor use. These products include all charging levels, including Level 3. These standards are used to cover the particular Personnel Protection System that is required by the National Electrical Code under Article 625 (paragraph 625.22). 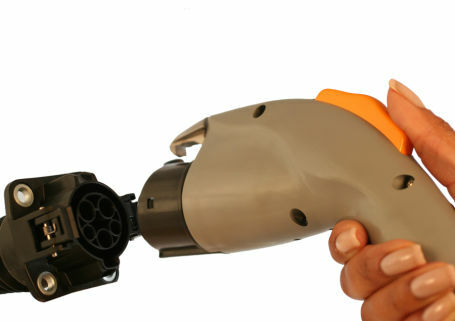 This standard is used to cover the actual EV connector and EV inlet provided to connect a vehicle to the power source. If the parts on the vehicle side of the cable, they are considered to be connectors and inlets (the combination of which is a coupler), or if on the power source side of the cable, a receptacle and plug. These particular components are not intended for direct connection to a normal receptacle in the wall, and NEMA type receptacles are not included in the scope of this standard. This outline covers batteries for use in electric vehicles. Specifically, Nickel, Lithium Ion, Lithium Ion Polymer cells, cell modules, and battery packs, for use in EVs. This outline covers supply equipment, which is defined as a device that delivers power to an on-board charger. These products include portable or stationary cord sets, charging stations, and power outlets. The differences in these products are as follows: EV cord sets consist of a power cord for connection to the typical NEMA receptacle in the owner’s garage, an electrical enclosure in the middle to house personnel protection components and other control type components, up to 25 feet of EV cable and the EV connector. This product may be transported from place to place (portable) or hung in a dedicated space for use in one location (stationary). Charging stations are products that are provided with a cable or a means to connect a cable, and the personnel protection equipment components required by the National Electrical Code are housed in the device. Power outlets are similar to charging stations, but they are not provided with personnel protection equipment, as they rely on the portable cord set to be brought to the charging location and the personnel protection is provided by the cord set. This standard is used to cover the cable types EV, EVJ, EVE, EVJE, EVT, and EVJT, which are the six cable types defined in the National Electrical Code as a suitable cable type for use with electric vehicles. See 625.17 of the National Electrical Code. This outline covers the cable and wiring harnesses used on board an EV for interconnection of the different components within the charging path. This outline covers the actual connectors at the end of the cables covered under UL Subject 2733 above and these connectors are used to provide an electrical connection between the components in the charging path. This series of standards covers the motor construction, tests and protection means by combining the general requirements with the appropriate part of the series. Not all of these are relevant for EV’s, for example Fire Pump Motors does not apply, but i included all the titles for the sake of clarity so you would not wonder where the missing part numbers were. 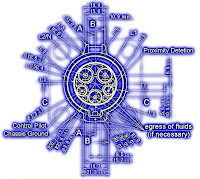 If you have a thermally protected motor, you would combine part 1 and part 3 together to cover the motor. These motors would be considered suitable for use on board a vehicle. This outline will cover the utility meter for smart grid applications. This covers the standards currently in place. Please note, UL Subject 2733, UL Subject 2734 and UL Subject 2735 are not yet published, but will be soon as they are already in the process. What is it for? CHAdeMO is the Japanese standard for fast (62.5 kW) DC charging of Electric Vehicles. CHAdeMO" is an abbreviation of "CHArge de MOve", equivalent to "charge for moving", and is a pun for "O cha demo ikaga desuka" in Japanese, meaning "Let's have a tea while charging" in English. As of 4/2012, there are 1,155 installed CHAdeMO DC Quick chargers in Japan (917), Europe (206), and ROW (32)...of which there are a growing number in the US (see map). Their are currently six cars that support the CHAdeMO plug, including the Nissan Leaf and Mitsubishi i-MiEV. This is a great resource for just about everyone. I never knew so much details go into making power cords. Timely and fair enough to come up with a standard measure of what should a basic charger should have and what are the basic capacity of it. This will serve as the different electrical companies' basis on producing effective and high-end chargers. And it'll put the consumers' safety at rest cause it'll make sure that they are getting what they needed. I always thought that EVs are good alternatives to fuel-pumped autos. Cause, apart from the cheaper charge up for these, they are also environmental friendly vehicles. This is wonderful. Engineers are making big contributions to the betterment of our environment and the benefit of us! They should develop more of these until gas-powered cars are now outpaced. New Build Electricity Connection - Power On Connections has become the first Independent Connections Provider (ICP) in the UK to be accredited for ‘Self-Connection’ works in three Distribution Network Operator (DNO) regions: Electricity North West (ENW); Northern Power Grid (NEDL and YEDL) and UK Power Networks (UKPN).